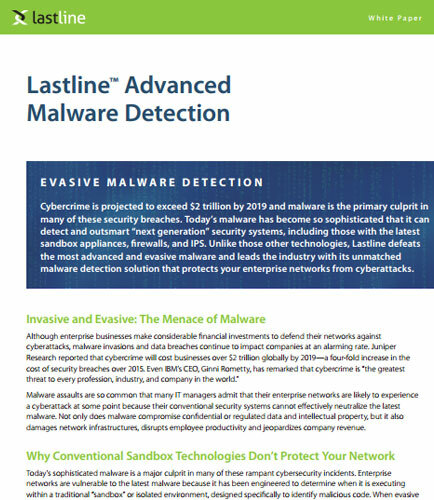 "Advanced Malware Protection & Detection by Last-line Security"
Today’s sophisticated malware is a major culprit in many of the rampant cybersecurity incidents. Unfortunately for organizations, advanced malware is getting harder to detect. Malware assaults are so common that many IT managers admit that their enterprise networks are likely to experience a cyberattack at some point because their conventional security systems cannot effectively neutralize the latest malware. Traditional malware detection technologies are unable to see what’s going on inside the operating system, or in the kernel that the operating system relies on. In such scenario an advanced malware protection approach is required to enable deep content inspection of all objects and to detect even the most evasive malware. Malware is an abbreviation for ‘malicious software.” It is used as an umbrella term to refer to worm, spyware, rootkit, trojan, virus and other threats to a computer system. These are basically software designed to damage a computer system(s) and/ or steal data. Yisrael Radai in the year 1990 coined the term malware, which was earlier referred to as virus. Malware are infamous for breaking into computer systems, exhibit unwanted advertisements, and gather confidential information.